The gods and goddesses of Greek mythology were once central figures in the lives of the Ancient Greece; and the pantheon of Greek goddesses and gods contained hundreds of distinct figures. Today, the best known members of this pantheon are the male gods, the likes of Zeus, Apollo and Hermes, but there were, in antiquity, an equal number of female Greek goddesses. The religious practices of Ancient Greece evolved over hundreds of years, and in later antiquity is was a male dominated religion, resulting in the marginalisation of many goddesses. This marginalisation saw the roles of many important goddesses taken over by male gods, but despite the marginalisation, there are many goddesses in Greek mythology of note. A timeline of the gods and goddesses of Greek mythology can be taken from Hesiod’s Theogony, a text recording the genealogy of the gods. According to Hesiod, the beginning of the cosmos was the time of the Protogenoi, the first born gods. 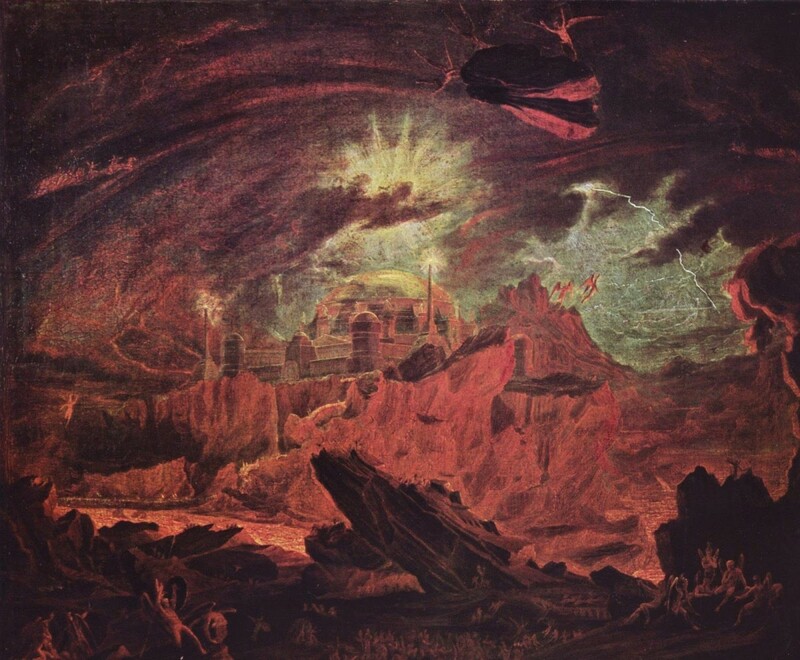 Chaos - The first deity to emerge was Chaos, the vast nothingness, and Chaos was nominally thought of as female. At about the same time other deities emerged; these being the male gods Tartarus (Hell Pit), Eros (Procreation) and the female goddess Gaia. Gaia - Gaia was probably the first widely worshipped female goddess of Ancient Greece. Gaia was the goddess of the Earth, and even today, neo-paganists still regard her as Mother Earth. Gaia was also given the title of mother goddess, for almost all other gods and goddesses in Greek mythology ultimately traced their ancestry back to her. Further gods and goddesses were then born, including male gods such as Pontus (Sea) and Ouranus (Sky), and female deities like Nyx and Hemera. Nyx – Nyx was the goddess of the night, born to Chaos. Nyx was an important personification, bringing the darkness of night to the earth each day, but she was also important as mother to many other deities and daemons. The likes of Aether (Air/Light) and Hemera were her children, as were Thanatos, Hypnos, Eris, Nemesis and the Fates. Hemera – Hemera was the original personification of Day, and every morning she would disperse the darkness of her mother and father. 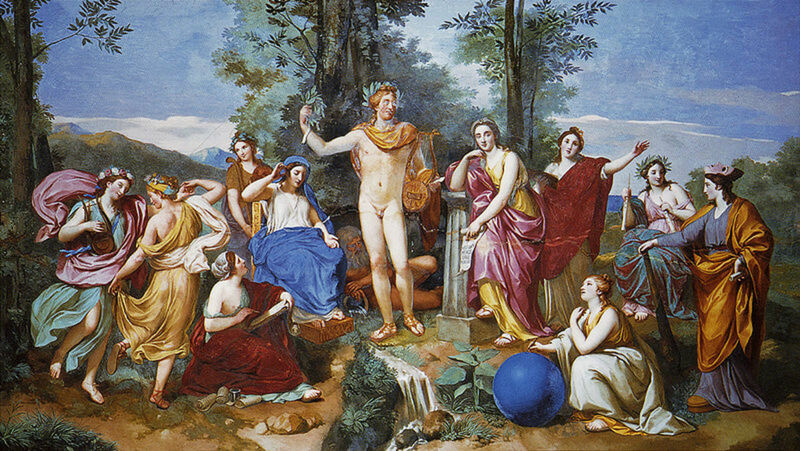 The surviving records of Greek mythology though show how even early on, female Greek goddesses became marginalised, for the first supreme deity of the cosmos was said to be Ouranus, the son of Gaia. When Ouranus mated with Gaia, a new generation of gods and goddess in Greek mythology appeared, with the most important of this generation being the Titans. 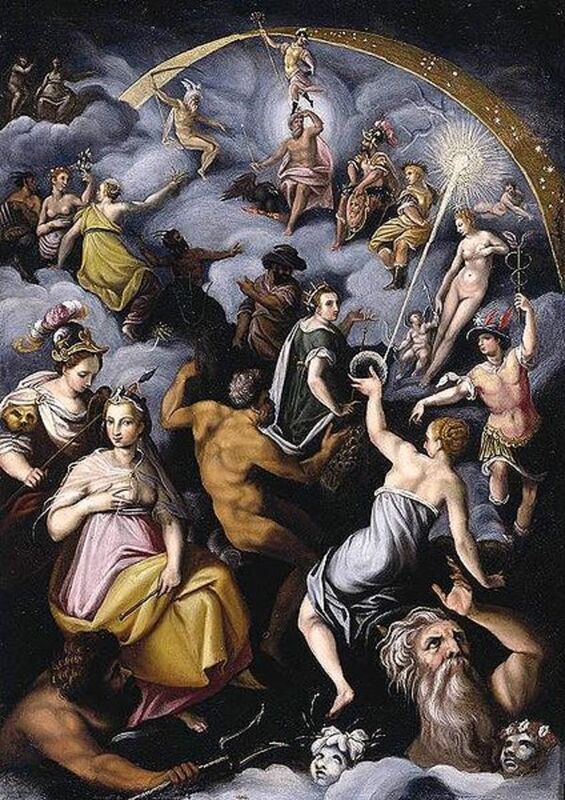 The Titans being six male gods, Cronus, Oceanus, Hyperion, Coeus, Iapetus and Crius, and six female Titans, or Titanides, being Rhea, Tethys, Theia, Phoebe, Themis and Mnemosyne. 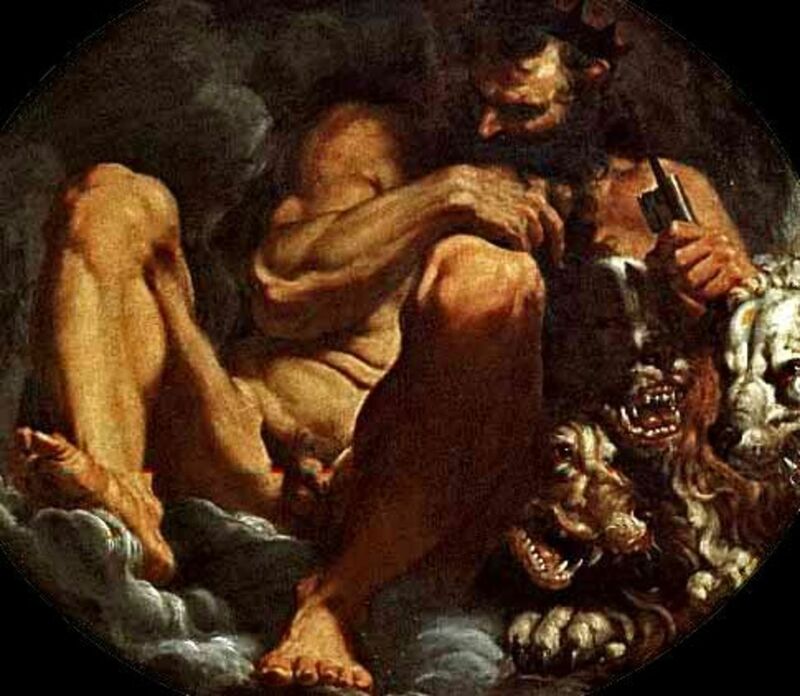 Gaia would incite her children to revolt against their father, although it was Cronus who ultimately wielded the sickle to remove Ouranus of his power. Subsequently though, the rule of the cosmos was divided amongst the 12 Titans, although Cronus wielded ultimate power. A “Golden Age” ensued where everyone prospered, and in this period the female Titans played an active role. Rhea – Rhea would become the wife of Cronus and would ultimately give birth to the first generation of Olympian gods; and would help save her son Zeus from imprisonment. During the Golden Age, Rhea was also the goddess of fertility and motherhood. Tethys – Tethys was the goddess of fresh water and was the wife of Oceanus. With water being so important to the Ancient Greeks, Tethys was a highly regarded goddess, and even more respected for she gave birth to the Potamoi and Oceanids. Theia – Theia was the Titan goddess of shining light, and to a degree would replace Hemera in Greek mythology. Theia was married to Hyperion, and together they brought forth the male god Helios (Sun), and the female goddesses Eos (Dawn) and Selene (Moon). Phoebe ­– Amongst the Titans, Phoebe was married to Coeus, and was regarded as the goddess of intellect. 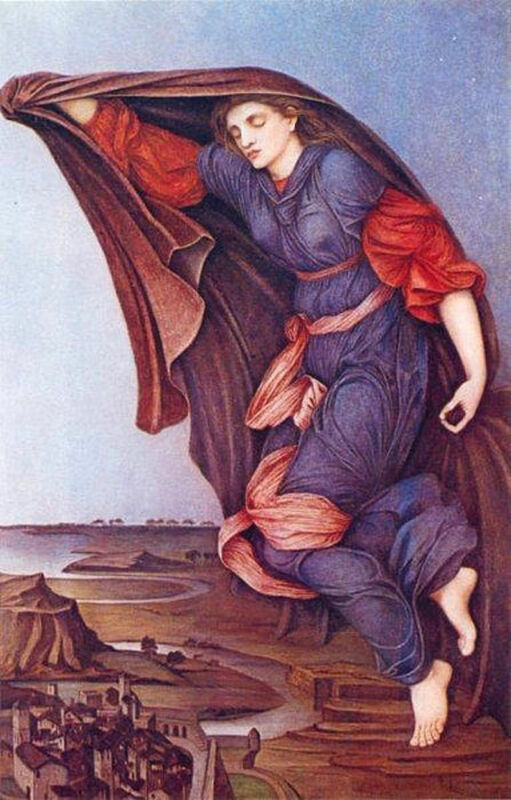 Phoebe was also closely associated with prophecy, and was a goddess once closely associated with the Oracle of Delphi. Themis – Themis was another important goddess associated with prophecy, although the goddess in Greek mythology was more closely associated with divine law and order. Mnemosyne – The sixth female Titan goddess was Mnemosyne, the goddess of memory and language. 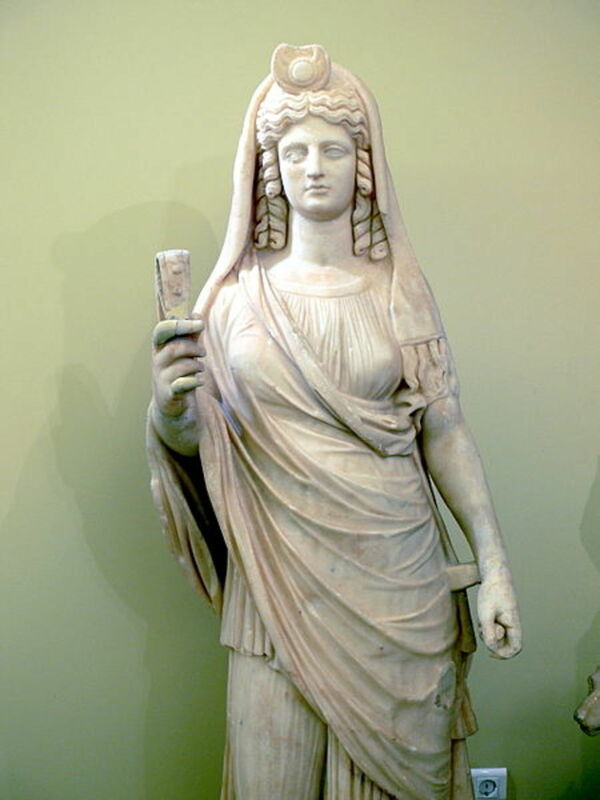 Originally she was the source of all written records, but later much of this skill was attributed to the daughters of Mnemosyne, the Younger Muses. The Titans would eventually be overthrown by the gods of Mount Olympus, and a new order of deities was created under Zeus; and the importance of the Greek goddesses that had gone before diminished to a greater or lesser extent. 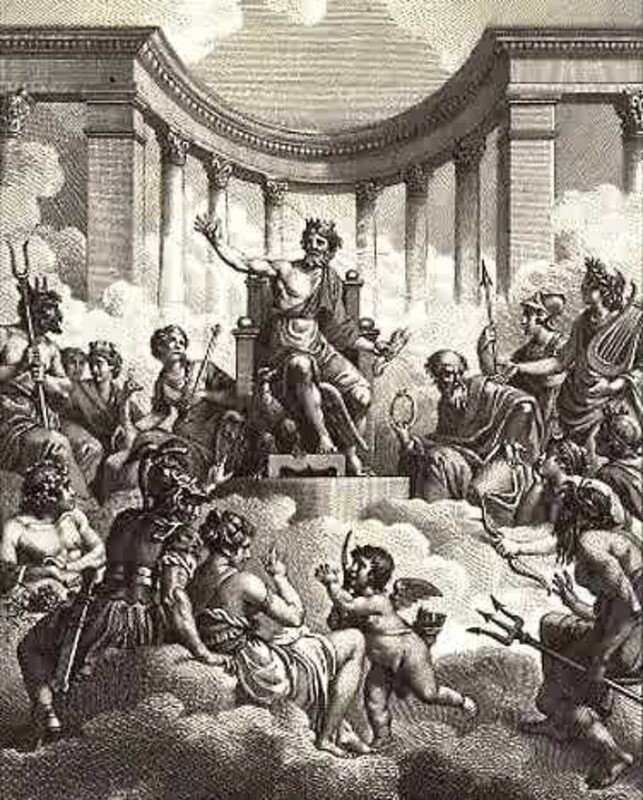 Zeus created a power base of 12 deities on Mount Olympus, and originally, like the Titans before, there was an even split of gods and Greek goddesses. The six original female deities of Mount Olympus were the three sisters of Zeus, Hera, Demeter and Hestia, and they were subsequently joined by Aphrodite, Athena and Artemis. 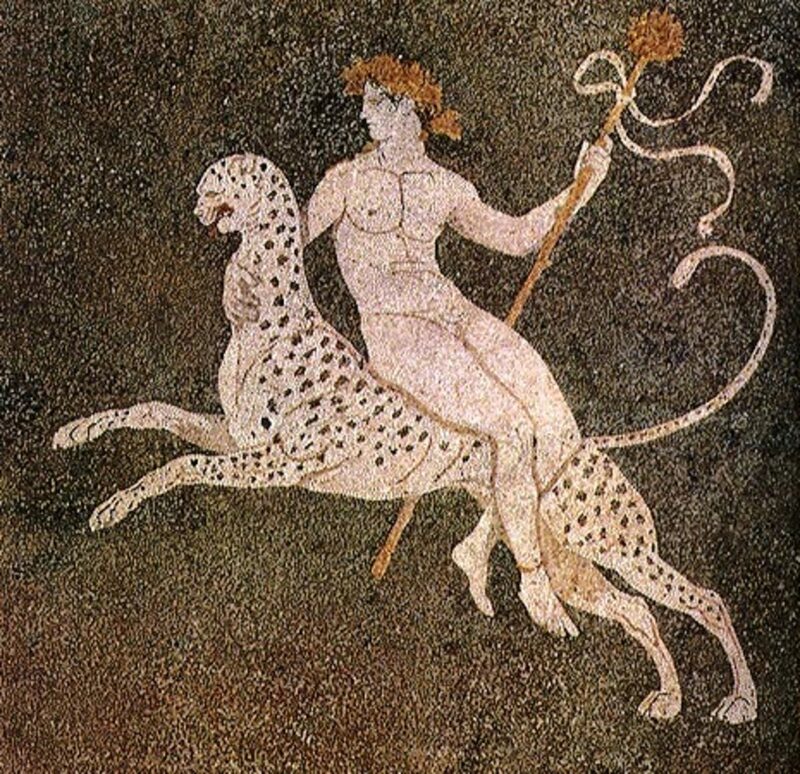 Whilst arguably today less famous than the likes of Zeus, Apollo and Hermes, in Ancient Greece all of these goddesses were important and widely worshipped. Hera – Hera would eventually become the wife of Zeus, and would offer her husband counsel; although much of her time seemed to be spent dealing with her husband’s indiscretions. Hera would also challenge her husband on occasion, although she had to be careful, for she was not seen as being as powerful as her husband. Amongst the Olympians, Hera was the goddess of marriage. Demeter – Demeter was the Olympian goddess of agriculture, and mother of Persephone. To the Ancient Greeks, Demeter was a vital deity, for it was down to her that the crops grew. Hestia – Hestia would tend to the hearth on Mount Olympus, and was regarded as the goddess of the home. Known as Vesta to the Romans, Hestia would be worshipped in virtually every home, with small statues to the goddess a common feature. Aphrodite – In essence the goddess Aphrodite was an aunt of Zeus, born from the castrated member of Ouranus. Aphrodite was the goddess of love and beauty, and was the goddess responsible for people falling in love. 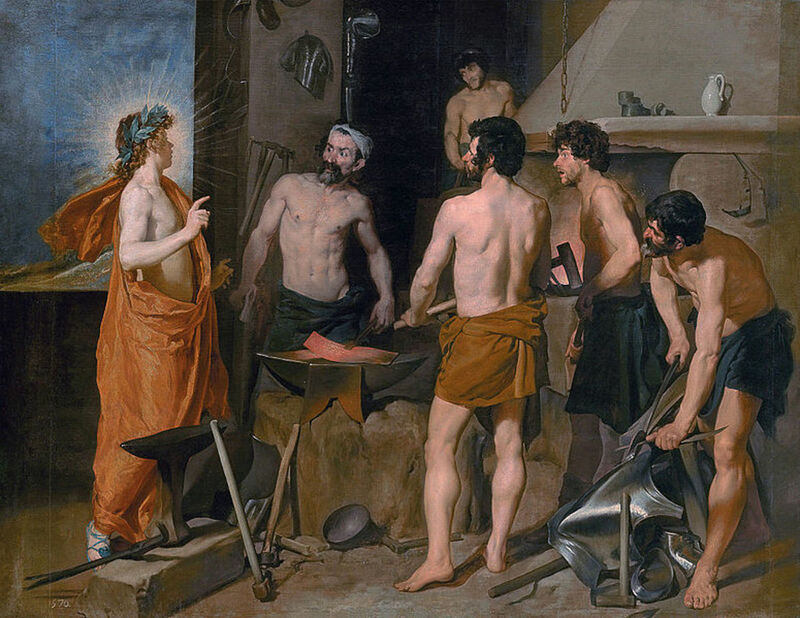 Athena – Athena was the daughter of Zeus, and the important goddess of wisdom, and it was this goddess that ultimately gave craftsmen the skill and knowledge to create. Artemis – The goddess Artemis was another daughter of Zeus, and was worshipped as the goddess of the hunt. As a huntress, it was recognised that no man could best her. There was also a change in make up in the gods of Mount Olympus, a change which again could indicate, a more male dominate religion. This change saw the goddess Hestia step down from her position, to be replaced with Dionysus, the male god of wine. Also on Mount Olympus the privileged position of cupbearer of the gods changed, and Hebe, a daughter of Zeus, was replaced by Ganymede. Away from the gods of Mount Olympus there were of course many other female Greek goddesses and figures, with differing levels of importance. Iris (Rainbow), Eos (Dawn), Selene (Moon) and Nemesis (Revenge) were all female goddesses in Greek mythology. 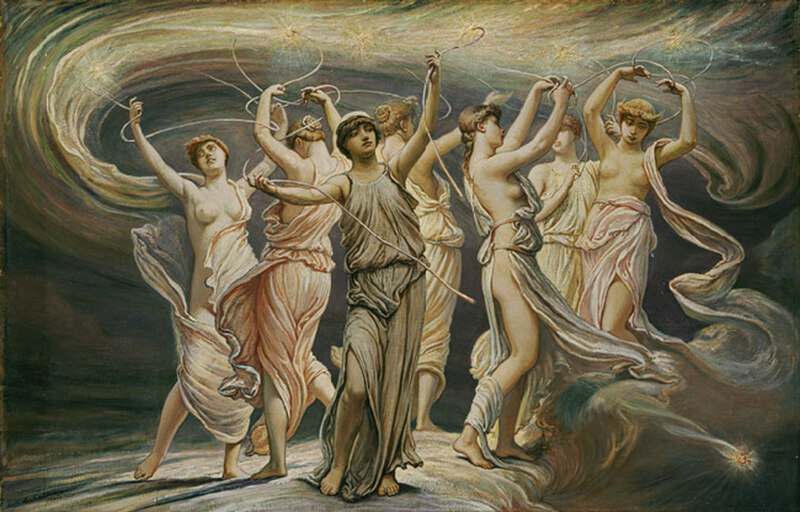 The majority of groupings in Greek mythology were also female, with the Oceanids, Naiads and Nereids, being water nymphs, and other nymphs included the Hesperides and Pleiades. The Sirens, Gorgons, Harpies, and Graeae, were of course also female. The usurpation of goddesses in Greek mythology can be seen with the example of the Oracle of Delphi. At Delphi the earliest religious sanctuaries were dedicated to Gaia; and ancient writers agree that the Mother Goddess was the first deity associated with the site. Indeed, Delphi was said to be the middle point, or naval, of the Earth. Gaia though would then pass on ownership of the site to Themis, and Themis would pass it on to Phoebe; a transition through three Greek goddesses. The end of female ownership of Delphi though, would come to an end with the arrival of Apollo. Apollo would track the Python to Delphi, and would kill the giant serpent on the site. Thereafter the temples at Delphi were dedicated to Apollo, as were other Oracles across the ancient world, and the priestess and Sibyls were all now associated with the male god; with prophecy also now a gift of the god. A mother's love is stronger than the wrath of all mythological gods. When Persephone, goddess of Spring, was kidnapped, her mother, Demeter, faced two of the most powerful gods in Greek mythology. Athena was the Greek goddess of wisdom and crafts. A complex figure, there are many important myths about her including her contest with Poseidon,the metamorphoses of Arachne and how she was born from Zeus' head. Very interesting. I look forward to your hubs.